This guide will attempt to encompass everything someone living in the Toronto area might want to know about flying out of U.S. airports. Niagara Falls is served by 2 airlines, Allegiant Air and Spirit Airlines. Allegiant Air can have low prices to Florida (the only destination they fly to from IAG), while Spirit Airlines can have low prices to a few select U.S. cities (Las Vegas being the most popular choice). Spirit also flys to Central and South American destinations such as Colombia, Guatemala, Nicaragua, and Peru). But you should also know that Spirit is generally considered the worst carrier in North America. Not in an unsafe way, just as low-frills and budget as it gets when it comes to comfort. It's a regional airport, so it's strengths are serving the relatively few destinations listed above, served by those two airlines. Also, when comparing costs, be aware that Allegiant and Spirit charge extra for absolutely *everything*, including even carry-on luggage now. 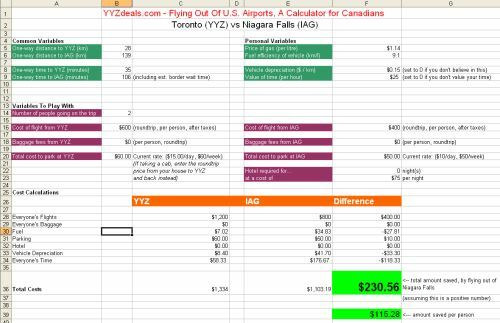 Go to the YYZ vs IAG worksheet and enter in a few variables to calculate what your true savings would be. 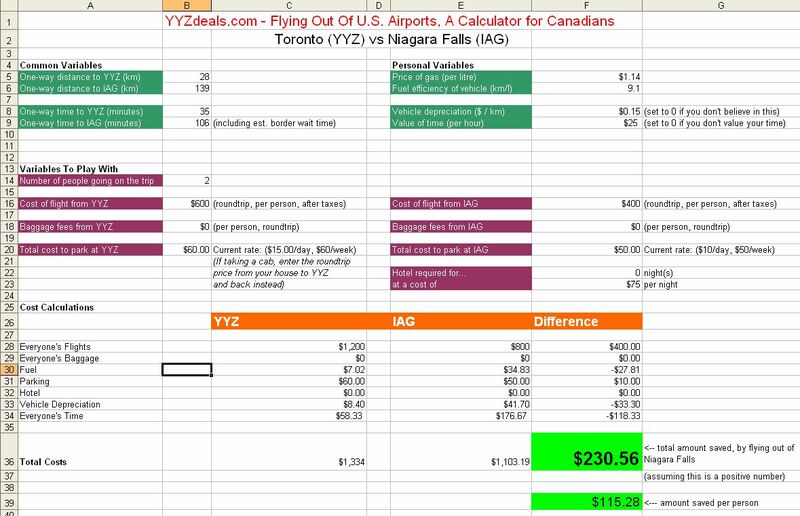 Using common averages, I've found that if the flight from Niagara Falls is about $100/person less than a similar flight from Toronto, the average person is only breaking even. In my opinion, when the flight from Niagara Falls is at least $200 less per person than the flight from Toronto, it becomes worth the drive. This is based on my calculations using average factors, and 2 people in a vehicle. You can see the example in the spreadsheet that was used to draw this conclusion. Parking is currently $12/day, or $60/week according to the Niagara Falls Airport website. Is there any public transportation from Toronto to Niagara Falls (IAG) airport? Greyhound.ca offers bus service to Niagara Falls Int'l Airport for $28 roundtrip, departing from Bay & Dundas. Update Jan 20, 2015: It appears that Greyhound no longer offers bus service from Toronto to Niagara Falls airport. - If you take the Queenston / Lewiston bridge, have USD with you (specifically, $1 bills) because there is a toll on the 190 and they don't take CDN. Buffalo is a major U.S. airport, with practically every airline you can think of. There have been some truly amazing deals out of Buffalo in the past, notably to international destinations. Being a relatively large U.S. airport, with so many airlines serving it, the chances of a great deal out of BUF are high. It's usually a question of whether the price differential is great enough to warrant the approximately 2 hour drive each way. If you've downloaded the Excel file, please note that you will need to switch to the YYZ vs BUF worksheet at the bottom of Excel. 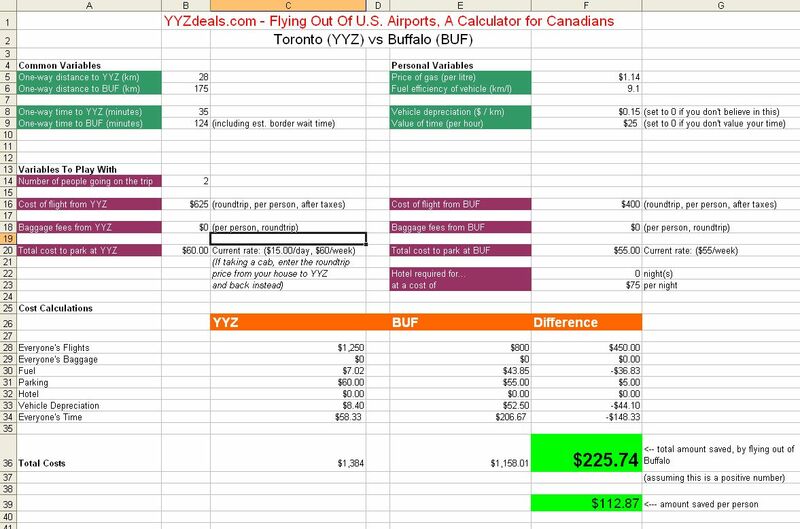 Go to the YYZ vs BUF worksheet and enter in a few variables to calculate what your true savings would be. Using common averages, I've found that if the flight from Buffalo is about $125/person less than the flight from Toronto, the average person is only breaking even. In my opinion, when the flight from Buffalo is at least $225 less per person than the flight from Toronto, it becomes worth the drive. This is based on my calculations using average factors, and 2 people in a vehicle. You can see the example in the spreadsheet that was used to draw this conclusion. Parking is currently around $11/day, $55/week at Buffalo Airport. There's a coupon on their page to save a whopping $1/day. According to ParkRideFly off-airport parking ranges from $7 to $8 per day. Is there any public transportation from Toronto to Buffalo airport? MegaBus offers bus service for about $20 roundtrip. Occasionally in the past they've offered crazy $1 fare promotions. Booking through the U.S. site is cheaper than booking through the Canadian site. (ROC) - 2 hours, 45 min drive from Toronto. Airlines flying out of this airport are fairly identical to the ones flying out of Buffalo, so I can't see any real advantage or reason to include it in this guide. I've also never seen a deal out of Rochester that wasn't available out of BUF or IAG. If someone thinks I'm wrong for not including this airport in the guide, please let me know. (DTW) - 4 hours drive from Toronto. Again, the airlines serving DTW are fairly identical to the airlines serving BUF. However, I have seen some really insane deals out of DTW in the past that weren't available out of BUF. The trouble of course, is that 4 hour drive! I've included Detroit in the spreadsheet, and calculated that the flight would need to be about at least $400/person cheaper to be worth the drive. So if it's a really, really insane deal, not available out of a closer U.S. airport, DTW can be worth a look. toronto, yyz, buffalo, buf, guides, niagara falls, iag, detroit, dtw, rochester and roc. 18 Responses to "The Official Guide For Canadians Flying Out Of U.S. Airports (from Toronto & area)"
This is great, thank you! I've often considered flying out of Buffalo, then think of the drive. Knowing what price point I should look at will make the decision so much easier. i dont see any deals from niagra airport to vegas. What an incredibly well-thought out spreadsheet! Love it! I love to fly out of BUF. I have noticed that deals on flights to the West Coast are usually worth it, while flights to the East not so much. My general rule of thumb is that I'd want to save at least $200 on the flight cost before I even begin consider it. Nothing huge, but every bit helps! 2) The google maps link has people going over the Queenston / Lewiston bridge. While this is the shorter option on paper, in reality I've found that going through Fort Erie (Peace Bridge) is quicker because of border wait times. Last time i went through FE i was literally through in 30 seconds, vs. an hour+ at Q/L. So even though it's a 15 - 20 min detour on paper, it works out to be faster. This is for both entering and leaving the US. Great info, thanks Charles! I'll be adding that to the guide. Thanks everyone, I've added your great info to the guide. Keep it coming! If you go via the Queenston / Lewiston bridge to head to the BUF airport, have USD with you (specifically, $1 bill) because there is a toll on the 190. I've forgotten about this a couple of times and had to dig around my car looking for something to pay with (they don't take CDN as far as I know). Also, while the google map link for Fort Erie mentions that there are tolls, I haven't encountered one in any of my trips. Perhaps something was implemented since my last visit to BUF (June), but as far as I know there aren't actually any tolls. Thanks Charles! I added your tip about CDN money to the guide. Charles, both bridges have a toll coming back over which is why it may be showing up on Google maps for the Peace Bridge crossing. I think it's $3 and you can pay in either Canadian or US (or a combination of both). Other than that, there are no tolls. Niagara Falls Int'l Airport does have public transportation from/to Toronto. Greyhound operates bus for $14 one-way (advance purchase) from Bay & Dundas. My impression is that it generally takes longer to go thru security and customs at YYZ. Would that time be signficant enough to cancel out (some of) the wait time at the border? Interesting point KT ! Would probably first have to come up with an average difference in the wait time between the security *and* customs at YYZ vs just the security at BUF or IAG.